Buy Screen Defend Screen Guard Protector for iPad 2 iPad 4 online - Clublaptop - The largest online store by Manufacturer of Laptop Accessories and Spares. "Screendefend high quality laptop screen protector for Laptops & Notebooks are now available for the range of iPads. These are best screen protectors in India. Screendefend screen guards are ultra-clear and transmits true colors, 100% compatible with the mentioned iPad Model. 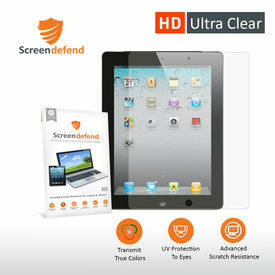 Screen Defend screen guard provides best screen protection to your iPad. Screen Defend screenguards comes in 3 layers and are available in different sizes for different models. Screen Defend screen protectors are made from high quality non-sticky material and can be easily removed without leaving any residue behind. We promise original like visual experience with no compromise on quality and clarity of screen. Please Note: This is a premium quality screen guard. Please take the help of an expert in the installation, if you are unable to do it on your own."